The fact that 2010 is the 200thanniversary of P. T. Barnum’s birth just crossed my desktop, so I thought a glance into the stacks to see what we have would be interesting. 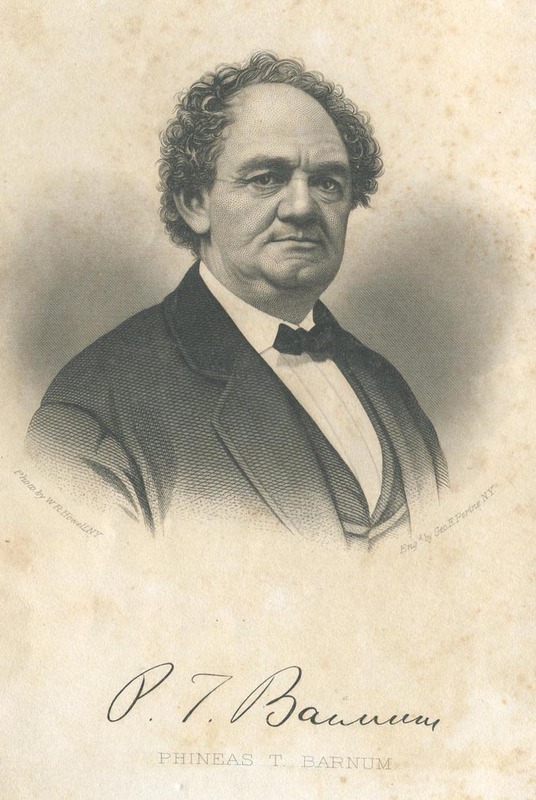 Barnum was born in Bethel, CT on July 5, 1810 to Philo F. Barnum, a merchant farmer who apparently descended from one of the eight original proprietors who established Danbury in 1685. His mother was Irena Taylor, daughter of Revolutionary War veteran Phineas Taylor. 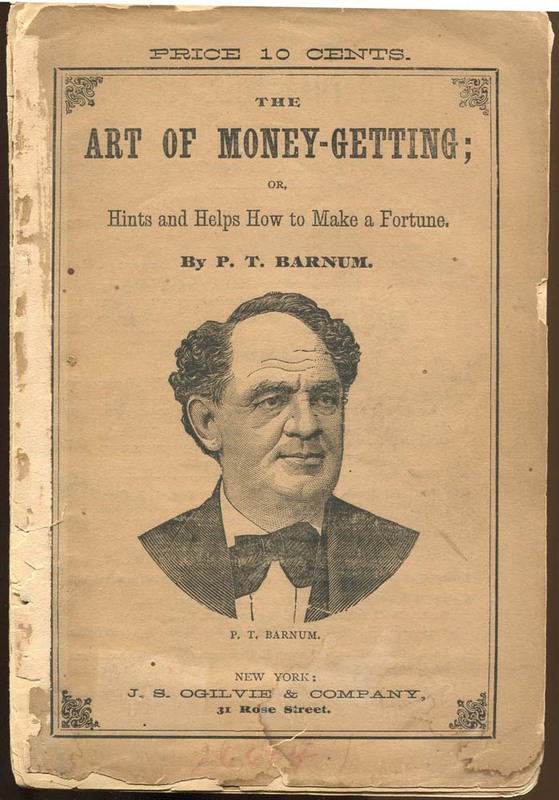 After a few false starts as a clerk and a newspaper owner, Barnum essentially moved to New York in 1835 and started shucking & jiving, beginning with purchasing the services of Joice Heth, purportedly the 161-year-old ex-nurse of George Washington, for $1,000, and making $750 a week by charging admission to hear her spin tales of our first president for a year until she died. Schemes like the American Museum and his various traveling shows (including The Greatest Show on Earth) generated tremendous crowds and fans, and had an enormous impact on American popular culture. The Watkinson has a nice handful of sources, including the second edition of Barnum’s autobiography, entitled Struggles and Triumphs: Or, Forty Years’ Recollections (1869)–from which the portrait of Barnum shown here was scanned. “Without printer’s ink,” Barnum once said at a banquet in his honor, “I should have been no bigger than Tom Thumb.” We have a copy of his Humbugs of the World (1866),which includes some of his theories about the effective use of publicity. 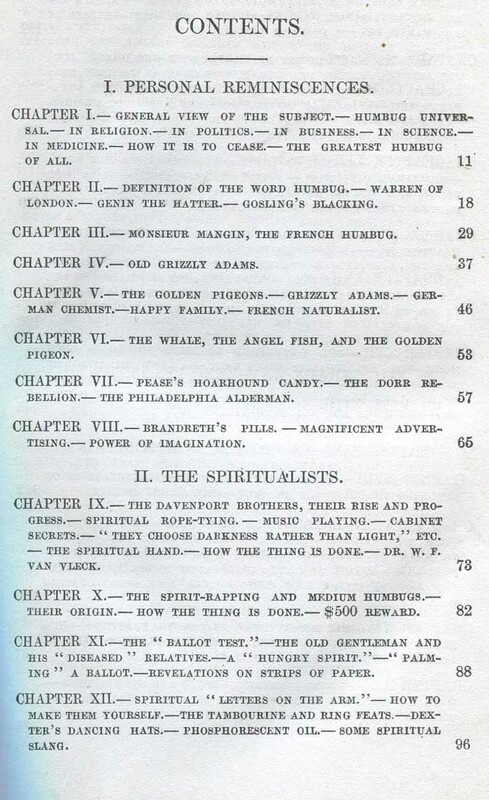 Barnum defined a “humbug” as “putting on glittering appearances–outside show–novel expedients, by which to suddenly arrest public attention and attract the public eye and ear.” I include here a page from the table of contents. “The Art of Money-Getting, or Success in Life” was first delivered as a lecture to an audience of over 2,000 in London on December 29, 1858, and in the London Times review of it the next day, its organization was likened to Cicero’s De Officiis. 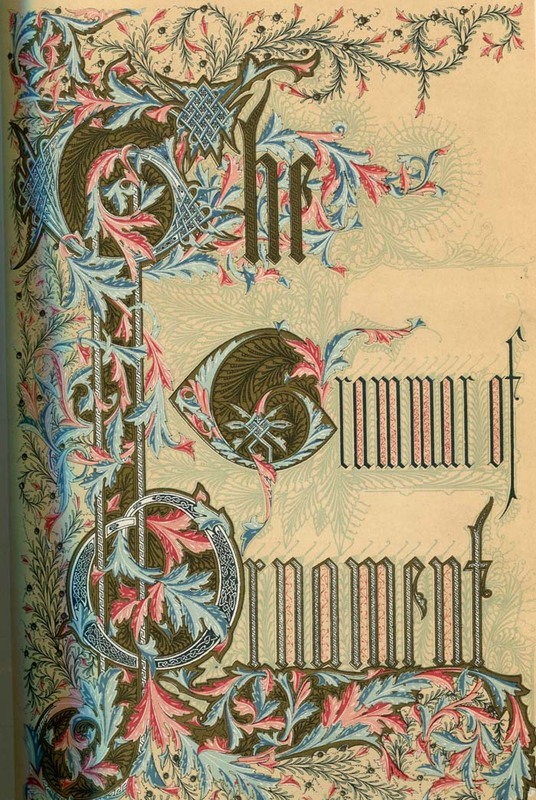 On our shelves we have an edition of this printed in 1882. 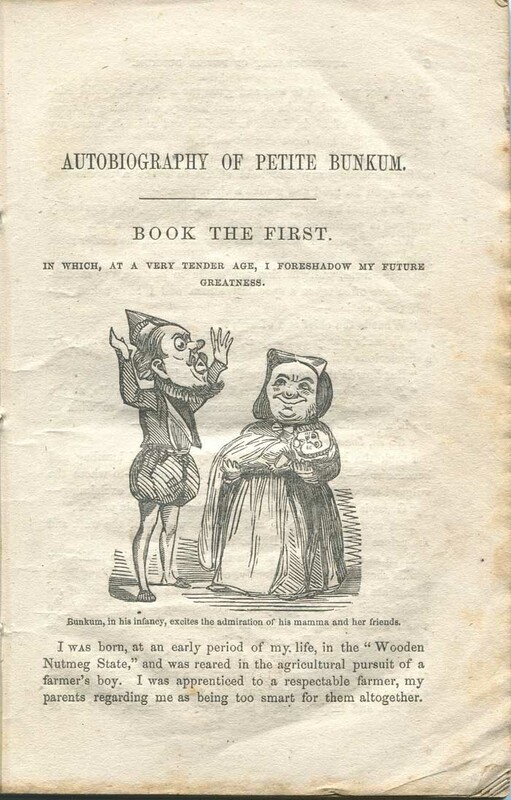 The final nugget is, according to biographer A. H. Saxon, “an anonymous burlesque” by one of Barnum’s journalist friends, entitled The Autobiography of Petit Bunkum, the Showman, published in 1855–the beginning of which is shown here. 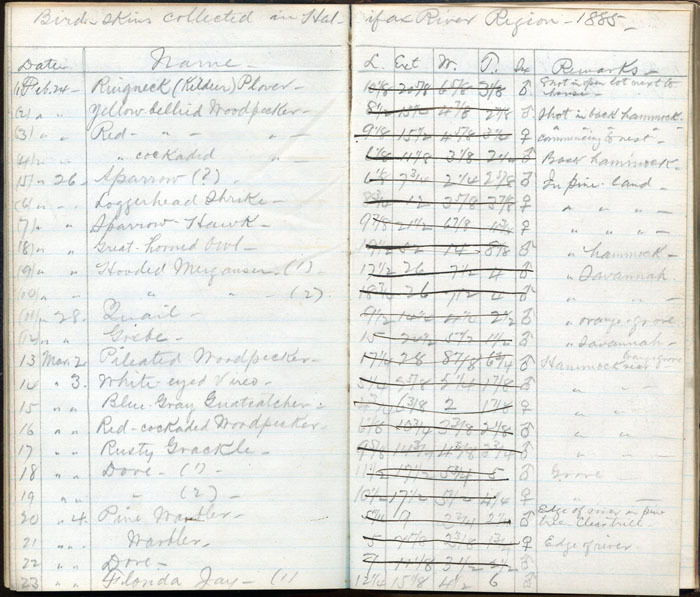 Two manuscript journals by different authors, one recording a seaman’s nautical journey launched in 1881 from Saint John, New Brunswick, with stops at Saint Pierre, Long Harbor, and Halifax; and one a Brooklyn man’s 1885 trip to Florida by way of Alabama, Mississippi, Louisiana, and Georgia, mostly via train. 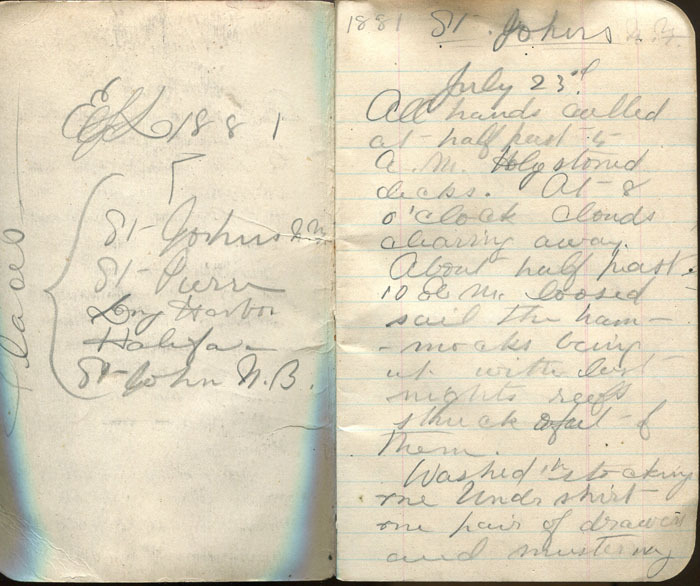 The sea journal describes the sailor’s never-ending efforts to keep the decks clean with sand and holystone and to keep himself clean as well; when no such labor is required, he reads “newspapers and history” or studies navigation and geometry, with a trip ashore noted for “target practice.” There is one account of a fierce and damaging storm, and another of the attempted rescue of a steamer wrecked near Halifax; a Newfoundland 5-cent stamp with an image of a seal is pasted into the book. At one point a lieutenant reads “the Articles of War”; it is possible, then, that this journal was kept on a Royal Navy vessel. The Origin and Progress of Writing, as well Hieroglyphic as Elementary, Illustrated by Engravings Taken from Marbles, Manuscripts and Charters, Ancient and Modern; also some account of the Origin and Progress of Printing. (London, 1803). Thomas Astle (1735-1803) was a paleographer and antiquary, “son of Daniel Astle, keeper of the forest, a descendant of an old family of the country.” This country-boy studied law initially, but (as is often the case when one studies the foundations of civil institutions and practices) developed a taste for history and its antiquities. 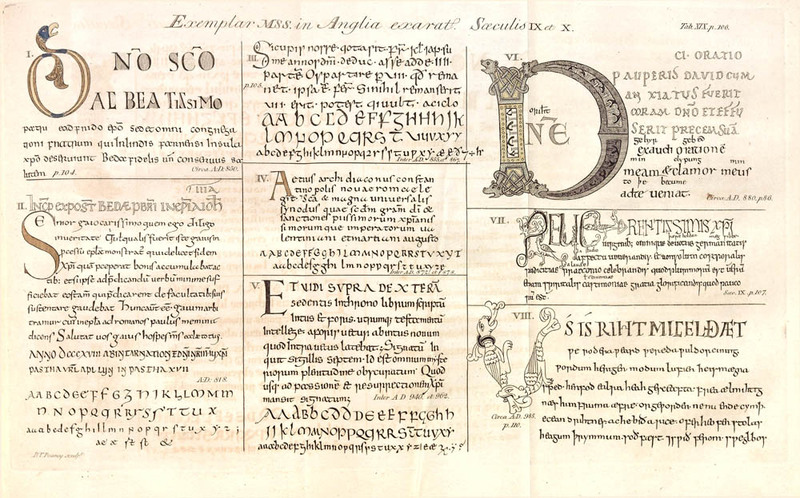 He cut his teeth on such matters by creating an index to the catalogue of the famous Harley Manuscripts (now in the British Library, see http://www.bl.uk/reshelp/findhelprestype/manuscripts/harleymss/harleymss.html). This sort of detailed, often tedious work either gives you the hot taste of antiquarianism, or turns you off books forever. After the death (1775) of Henry Rooke, chief clerk of the Record Office (essentially the National Archives) in the Tower, Astle was appointed to his place; upon the death of a superior eight years later, he took the higher office of Keeper of the Records–in both positions he proved zealous indeed. The first edition of this, his greatest work, was published in 1784. A full biographical sketch is in the Dictionary of National Biography. CARRIAGES. When wishing Hacks for Evening Parties, Receptions and Dances, get prices from F. P. Wilson. Tel. 1145. 20 Union Place. I have an interest in War of 1812 material, especially as we are approaching its bicentennial in 2012–but I also like sources which were created and used “on the ground,” so to speak, by working people. The feathers of birds make a considerable article of commerce, particularly those of the ostrich, heron, swan, peacock, goose, and other poultry; for plumes, ornaments of the head, filling of beds, and writing pens. See Quills. There are scarce any birds, but what Bed-Feathers may be procured from, particularly those of the domestic kind; yet swans, geese, and ducks are those that furnish most, and the best. Geese are plucked three times a year; towards the end of May, about Midsummer, and at the latter end of August; but chiefly when the feathers are ripe, that is, when they are perceived to fall off of themselves. The feathers of dead birds are in the least esteem, upon account of the blood imbibed by the quill, which putrefying, communicates an offensive smell to the feathers, and takes some time to evaporate; for which reason live birds should not be stripped till their feathers are ripe. Feathers are imported in this country from Poland, Germany and Russia. They are divided in white, half-grey, and grey; and value accordingly. The best feathers should be white, downy, void of large stems, fresh and sweet. Care should be taken that no sand be intermixed, which is frequently practiced to increase the weight. Ostrich feathers are dyed and dressed by the Feather-dressers, to serve as ornaments. They are a very costly article, brought to us from Africa, and particularly the coast of Barbary. Most of the prepared feathers used for ornament are manufactured in France and England, and imported into this country in that state. The variety resulting from the dictates of fancy is so great as to preclude particular description; the duty for ornamental feathers is 32.5 per cent ad valorum in American and 37.4 per cent in foreign vessels. The Watkinson has a limited run of the print version (May 1812-May 1814), but the Library subscribes to the fuller run (1812-1820) online, through our subscription to America’s Historical Newspapers. You can get to the online version here: http://library.trincoll.edu/voyager/shortcut.cfm?BIBID=891420. Born into a well to do mercantile family in Hamburg, Germany, Peter Adolph Grotjan (1774-1850) had already gained considerable commercial experience before he decided to emigrate to the United States at the age of 22 to take advantage of what he saw as the greater opportunities. Settling in the nation’s capitol, Philadelphia, drew upon his connections in Hamburg for consignments and quickly cultivated working relationships with a number of local merchants. Within two years of his arrival, Grotjan’s stock had risen, figuratively, and he had established himself as a young entrepreneur. He formed a brief partnership with another young merchant, F. H. Holtzbecher, which developed into a joint venture running a store in Reading. Although the arrangement lasted for only a little over a year, Grotjan gained his first taste of Democratic politics in Reading and using his connections, he and Holtzbecher established connections with a clientele that reached across the state and beyond. After the amicable dissolution of his partnership with Holtzbecher, Grotjan returned to Philadelphia to resume business on his own. Despite a series of financial setbacks during the first decade of the 19th century caused by the defaulting of a few of his debtors, Grotjan’s trade expanded into the interior of Pennsylvania, and eventually to the ports on the Atlantic seaboard and the Caribbean. 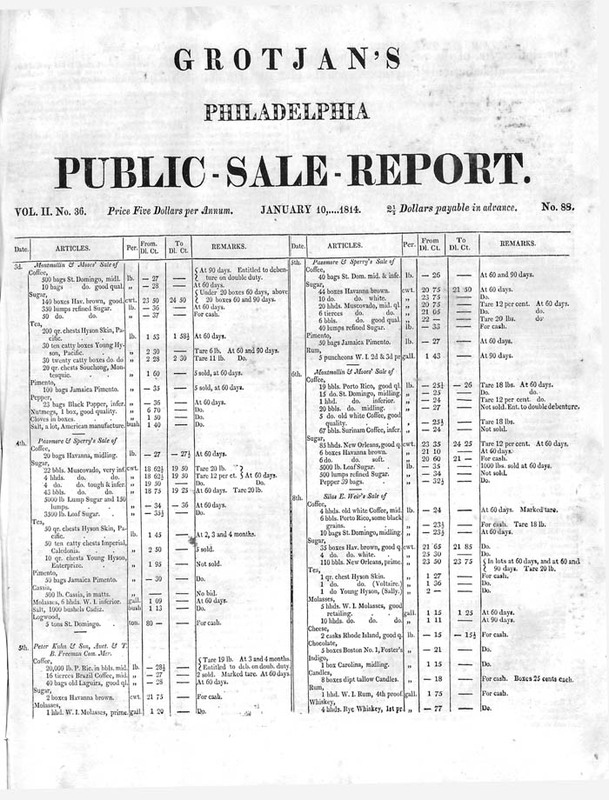 From 1812 to 1822, he published a commercial newspaper Grotjan’s Philadelphia Public Sale Reports, using his position as an entree into Democratic Party politics. So committed was he to the party that he named his third son Thomas Jefferson Grotjan. Although Grotjan never held major public office, he helped found the Philadelphia Hickory Club in 1822, was involved in local elections, and twice served as Philadelphia County auditor, 1828-1836 and 1841-1844. There are many books in the Watkinson that relate to design, and I’ve often found that designers are elated when they see such books. 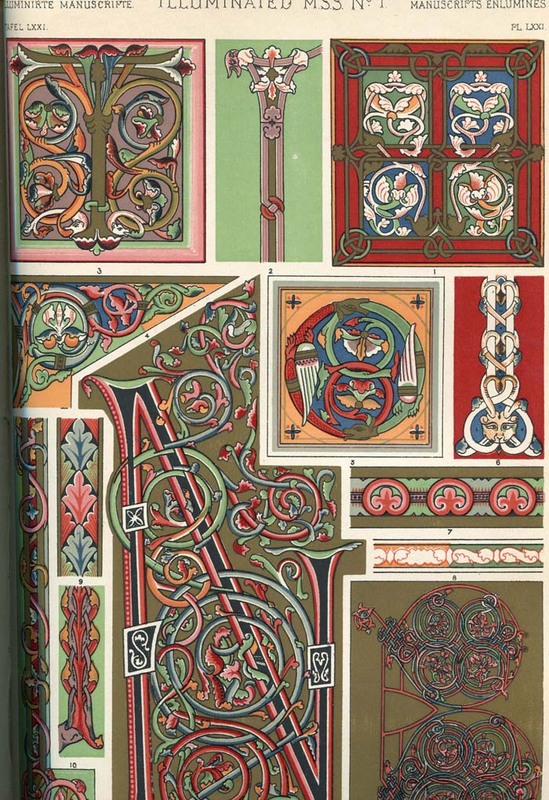 Owen Jones produced one such in 1868 (The Grammar of Ornament), which we have on our shelves; it contains 111 plates (chromolithographs) plus the amazing title page, shown here, and surveys ornamentation used by aboriginal tribes and the peoples of ancient, medieval, and modern Europe and the Middle East. I saw a copy of this novel (our copy shown here) in a recent catalog, described as “a striking novel of English children loosed upon poor unsuspecting Caribbean pirates. 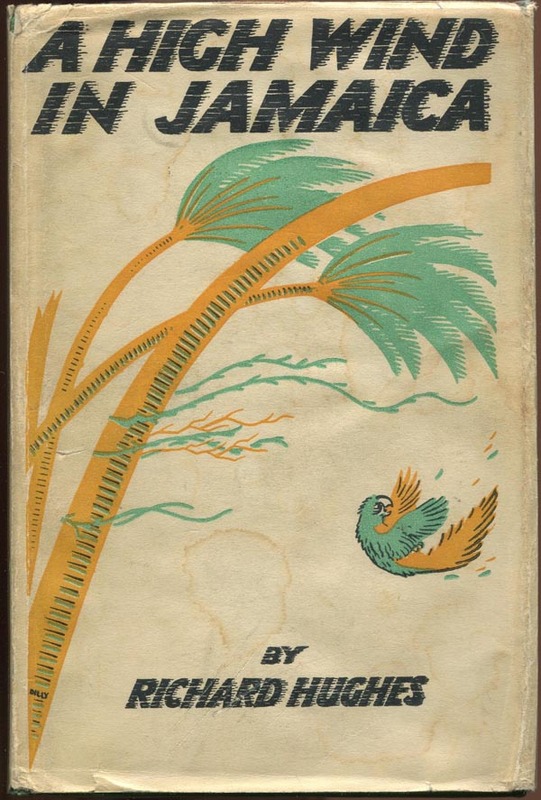 Described by Rebbecca West as ‘a hot draught of mad, primal fantasy and poetry, A High Wind in Jamaica is one of the best novels about childhood ever written. '” The book was published in the U.S. under the title The Innocent Voyage. You are currently browsing the The Bibliophile's Lair blog archives for September, 2010.